I pay my first visit to the "Googleplex" in a few days and thought I'd prepare by seeing how this website, www.DanielPipes.org, does in Google's rankings. I started out with the hot name of the moment, "Barack Obama," and was midly stunned to see that I come in #5, following only Obama's campaign site, his Senate site, Wikipedia, and Reuters – and ahead of nearly 61 million other entries. 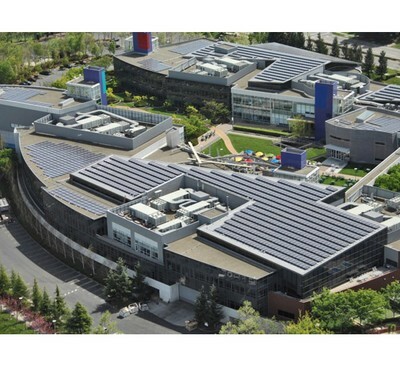 The "Googleplex" in Mountain View, California. Ken Livingstone – #12 out of 2,350,000 entries. Mearsheimer-Walt – #10 out of 21,000 entries. Siraj Wahhaj – #8 out of 33,100 entries. Ibrahim Hooper – #7 out of 45,300 entries. Barack Obama – #5 out of 60,700,000 entries. Hamid Dabashi – #4 out of 54,600 entries. Tariq Ramadan – #4 out of 504,000 entries. Salman Rushdie – #4 out of 2,860,000 entries. Omid Safi – #3 out of 12,200 entries. Kamal Nawash – #3 out of 15,000 entries. Rashid Khalidi – #3 out of 116,000 entries. Kamran Bokhari – #2 out of 3,700 entries. Louay Safi – #2 out of 9,000 entries. Jamil Al-Amin – #2 out of 12,700 entries. Hussein Ibish – #2 out of 18,300 entries. Lorraine Ali – #2 out of 35,500 entries. Khaled Abou El Fadl - #1 out of 44,800 entries. Muslim Public Affairs Council – #9 out of 46,800 entries. Council on American-Islamic Relations – #6 out of 291,000 entries. Canadian Islamic Congress – #4 out of 41,700 entries. Progressive Muslim Union – #3 out of 10,200 entries. Tarek ibn Ziyad Academy – #3 out of 14,500 entries. American Muslim Council – #3 out of 31,900 entries. Khalil Gibran International Academy – #3 out of 50,200 entries. (1) At a time when Google arguably is the world's single most important source of information, these rankings inspire me to stay hard at work.